A Chinese maritime helicopter carried out a patrol mission in the South China Sea on Monday afternoon, the Guangdong Maritime Safety Administration said. 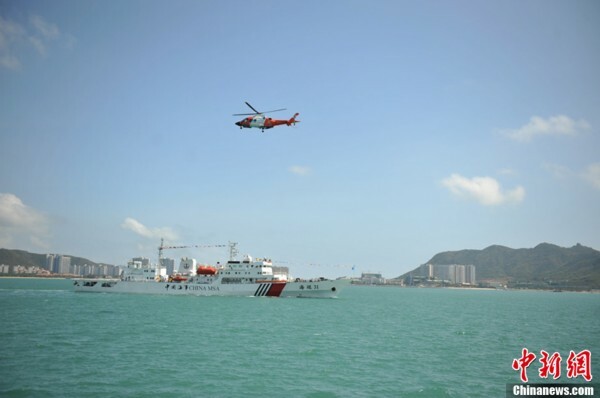 The helicopter took off from the Haixun 31, a marine surveillance ship, to monitor maritime traffic in waters near Dongmen Reef of the Nansha Islands. The administration said it was the first time for a Chinese maritime helicopter to be dispatched to patrol the South China Sea. The Haixun 31 is one of three Chinese marine surveillance ships that departed last Thursday from Sanya Port in south China’s Hainan Province to carry out patrol missions in the South China Sea. The fleet has since covered 800 nautical miles, monitored the navigation environment in waters near the Xisha, Zhongsha and Nansha Islands and conducted safety inspections for more than 40 Chinese and foreign vessels. The patrol missions are aimed at strengthening the country’s maritime law enforcement capacity and testing the patrol team’s rapid response abilities in the South China Sea.